White Grizzly is the most famous strain from Kootenay Mountain Seeds. The original hybrid landrace bred by the Greenstones since 1895. The genetics here are sturdy because of the area the seeds are from. The Kootenay Mountains are steep and heavily forested. Located in the outrageous corner of BC, Canada. More famous for its weed, they're also known for having crazy inhabitants as well. If you are looking for some rugged strains that grow well outdoors, then look no further. 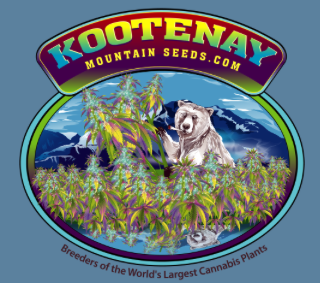 The Kootenay Moutain Seed Bank is the only choice for growing in cool mountainous regions of the world. When I harvest White Grizzly, I kick off the ice and snow and they take it. Kootenay's strains are preferred for patients that have never grown anything before. They're perfect for small legal outdoor medical grows in the harshest climates of the Rockies. When you need some creative inspiration, I love to smoke a bowl of Kootnay Mountains strains. I prefer to grow their seed stock over all others in the Mountains of Quebec.